Audimute offers visually appealing products that not only help with acoustics but also counteracts as home and office décor. Hang from the ceiling, the wall or use our materials in your reconstruction or construction project to solve your acoustic issues. Our products are made with recycled materials, non-toxic, and are NRC and STC tested. 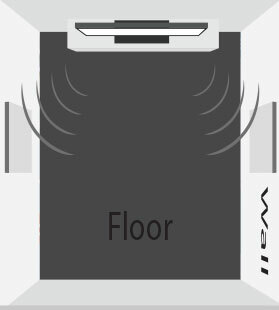 Audimute Acoustic Specialists are trained to guide you to the most effective yet cheapest sound solution for your personal or commercial spaces. From Acoustic Panels to Ceiling Clouds to Peacemaker Soundproofing Underlayment, Audimute has just what you need to satisfy your soundproofing needs. The purpose of acoustic panels is to reduce reflected sound and dampen the echo and reverberation (by as much as 60%) in a properly treated space. 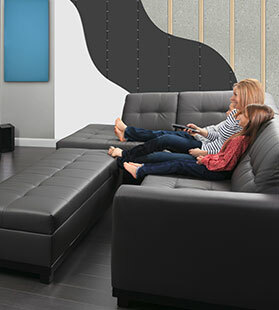 Audimute’s acoustical panel is an innovative eco-friendly panel using materials from the U.S.A. 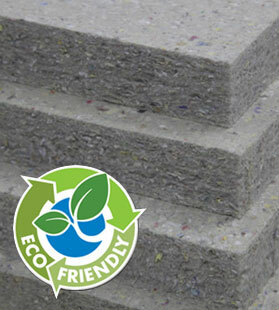 Improve the acoustics in your space with Audimute's new eco-friendly material, eco-C-tex. Audimute’s environmentally engineered health safe acoustics will perform as well or better than studio foam for sound absorption. Did you know that soundproofing and sound absorption are two completely different acoustic solutions? Knowing the difference between the two will lead you to identify the perfect solution. 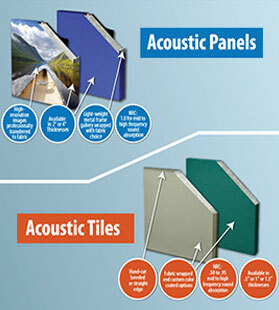 Do you know the difference between Acoustic Tiles and Acoustic Panels? It is easy to see how both products look similar, but when it comes to functionality, design, and application, each product works in its own way to achieve your soundproof solution. Cut costs and noise with Audimute's Sound Absorption Sheets. 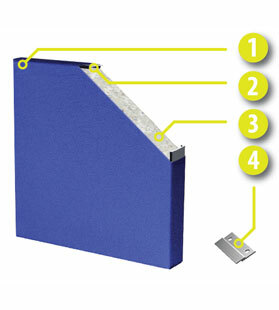 Our Sheets have been NRC tested, are portable and are easy to install. To learn more about our Sheets, contact on of our Acoustic Specialists at (866)505-6883. Do you know the best acoustic panel placement to improve your acoustics? The ideal scenario is to incorporate acoustic panels in your decor. In fact, most Audimute panels come in an array of color choices and even custom images options meaning that your friends won’t know that what they are looking at is an acoustic panel lending to the comfort of the room. The Class A fire rating means that the materials used in the acoustic wall treatments have received the highest rating possible under the ASTM E-84, a test that measures the burning characteristics of building materials. 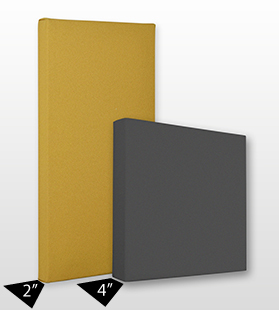 Our main product line includes Audimute Acoustic Panels and Bass Traps (4" panels) made of only Class A fire-rated acoustic materials. 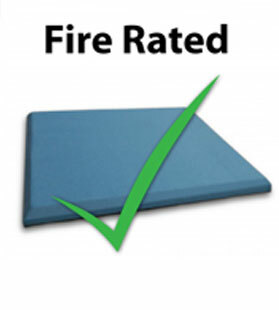 Our panels, unless otherwise specified, are covered by Class A Fire-Rated fabric by Guilford of Maine. 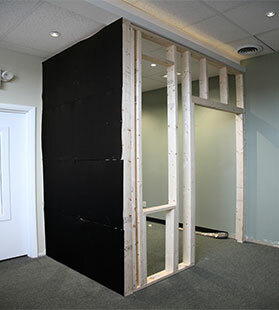 The main difference between Acoustic Panels and Bass Traps is the frequency that each effectively treat. 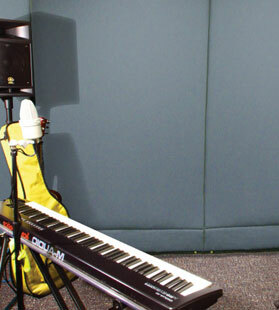 An acoustic panel (or 2” panel) is most effective at eliminating high-frequency noise while low-frequency noise problems requires bass traps (4" panels). Peacemaker, an acoustic insulation material used as a sound barrier, comes in three different densities to match your soundproofing needs. Use Peacemaker in your home, your studio or your office space to block the transmission of sound between rooms. To get more information on our acoustic products, fill out a free Room Analysis Form or contact one of our Acoustic Specialists at (866)505-6883.